We Rhode Islanders enjoy such a magnificent shoreline and marine environment that it’s no surprise when we attract tourists in droves, and have since the concept of leisure time filtered down through the rungs of the social ladder. 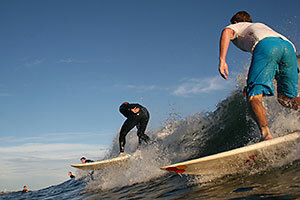 Coastal recreation and tourism in Rhode Island include cruise ship tourism, beach-related activities, surfing, boating, diving, and wildlife viewing. Climate change may affect people’s decisions about selecting coastal vacation destinations due to its impacts on the marine landscape, ecosystem, and infrastructure. The primary drivers of climate change may have direct impacts on the user groups associated with recreation and tourism in Rhode Island such as surfers, divers, fishermen, and beachgoers. What happens to our service economy if the shifting sands of climate change lead more people to select the predictable if fabricated Wonderful World of Disney? However, warmer water may also increase algae, seaweed and jellyfish, reducing water quality and the attractiveness of beaches and other water recreational activities. One prime example in Rhode Island is at Easton’s (First) Beach in Newport, where seaweed washing ashore has had a direct impact — to the eye and nose, most noticeably — on its use and desirability by and for tourists and locals alike. Sea level rise, reduced wind, more severe storms, and more winter precipitation and spring runoff may have negative consequences for recreation and tourism. Increased rainfall and runoff may increase nutrients (e.g., lawn fertilizer) and other land-based sources of pollution flowing into the sea, and may increase the overflow from combined storm and wastewater sewer systems. This can compromise water quality, exacerbate algae blooms, deplete oxygen in the water (known as hypoxia) and lead to more beach closures. The relationship between intense rainfall and beach closures is important to keep in mind. The 2011 beach season showed a decrease in events leading to saltwater beach closures, but there was an increase in closure days from the 2010 season. Where 2010 exhibited 45 closure events resulting in 70 beach closure days, 2011 saw 36 closure events and 74 beach closure days. A quick look provides the answer as to why fewer closure events resulted in a higher number of days with beach closures. The total volume of rainfall over the beach season was higher during the summer of 2011 (May 27 through September 5) than during the summer of 2010. Total rainfall increased from 13.42 inches in 2010 to 14.80 inches in 2011. More rain overall in 2011, right? However, significant rainfall instances, which are defined as greater than 0.50 inches in a 24-hour period, decreased in 2011, with 11 instances in 2010 and 9 instances in 2011. The result was more beach closure days in 2011. This all links up with increases in impervious cover — things like parking lots, roads and driveways — that prevent rainwater from sinking into the ground and filtering through the cleaning soils and gravel at a slow rate. The result is a rush of water heading for roadside drains or sewers and causing overflows at treatment plants. In the Flood of 2010, Rhode Islanders saw an intense version of this when buildings and roads were underwater for several days to weeks. More periods of drought are projected for the summer months. This will make freshwater more scarce and could lead to water use restrictions, creating difficulty for tourism infrastructure needs. In addition, Rhode Islanders often landscape homes, parks and businesses with plants and grasses that create a water intensive environment. Ironically, our landscaping standards are derived from the English and Irish countryside where rain is ubiquitous, so lush green lawns are an achievable standard. We will have to find our ideal landscape in Jane Austen novels and anticipate a browning of the Rhode Island landscape with the increased need for restrictions on water use. This loosing landscape battle also harms the aesthetics of the state. Increases in sea level and storminess will change Rhode Island’s shorelines significantly, potentially making them less attractive and less accessible. Barrier beaches on the south shore will be especially vulnerable Sea level rise, reduced wind, more severe storms, and more winter precipitation and spring runoff may have negative consequences for recreation and tourism. to increased erosion and landward migration as sea level rises. Increased storminess will result in more storm overwash, breaching of barrier beaches, and damage to shoreline real estate and development on beaches and lagoon shores. The cost of managing debris from such events is high—not only its removal but also the damage it can cause to nearby structures. Superstorm Sandy in 2012 showed the impact of storm surge on many South County and Westerly (RI) beaches as well as those on Aquidneck Island, all of which are major tourist attractions. Sites such as Narragansett Beach, which is a favorite for in-state day-trippers, were overwhelmed with waters climbing over walls to flood and close local roads leading to the sites. The impact on local businesses was also severe, and reclamation and restoration work is running into the millions of dollars to get the beaches back in shape as a draw for summertime visitors. A higher sea level may cause the migration or loss of habitats such as coastal lagoons and tidal salt flats that provide important ecosystem services. It can also result in damage or loss to coastal parks, coastal public access points, and open space. And saltwater intrusion in coastal aquifers that can accompany sea level rise may increase coastal freshwater scarcity and failure of onsite wastewater treatment. There is a pressing need to identify lands now where rising waters can retreat inland following a “planned pathway.” Some groups such as The Nature Conservancy are already working on this planning but private ownership of the vast majority of coastal lands is a major stumbling block. Longer summers and decreased snow season Extended summer season + + + ? Warmer water will bring more algae (red tide) and jellies n/a - - ? More periods of drought during summer could lead to water use restrictions - - - ? More acidic ocean May adversely impact shellfish and alter food web dynamics including fish and sea bird communities - n/a n/a ? Severe storms such as Superstorm Sandy cause serious beach erosion, reducing the beauty of beaches and thus attracting fewer tourists to coastal regions. Warmer winter temperatures with less snow will shorten the ski season in northern regions, thus ski-destination states like Vermont, New Hampshire, and Maine will draw fewer visitors. Damage to transportation infrastructure by major storm events will cause a decline in tourism; if destination locations are not easily accessible visitors will be deterred. This graph shows the difference between average sea level at Newport, R.I., from 1983 to 2001 and mean annual sea level plotted for each year between 1930 and 2011. The blue trend line shows a 26.8cm increase in sea level per century. Graph courtesy of Jon Boothroyd, 2012. Data Source.